San Francisco 49ers wide receiver Anquan Boldin scores a touchdown against the Washington Redskins at Levi’s Stadium on Sunday in Santa Clara, California. San Francisco beat Washington 17-13. San Francisco 49ers wide receiver Anquan Boldin scores a touchdown in the first quarter against the Washington Redskins at Levi’s Stadium on Sunday in Santa Clara, California. San Francisco beat Washington 17-13. UPDATE (Nov. 29, 3:52 p.m.): The interactive tables above have been updated to include the results of Thursday’s match-ups, and those games has been removed (the text of the article has not been updated). Turkey and football is an annual tradition. Turkey and meaningful football is a treat. So be thankful this year: When ranked by total playoff “swing” — a measure of how much each game affects the playoff picture1 — three of the top four Week 13 games will take place on Thanksgiving. When the Chicago Bears visit the Detroit Lions in the first Thanksgiving Day game, the stakes are straightforward. The Bears are largely out of playoff contention, so all affected teams do better with a Lions loss — excluding the Lions, of course. Thursday night’s game between the Seattle Seahawks and the San Francisco 49ers will have significant playoff implications, but probably not in the way envisioned when the schedule was drawn up. The NFC West title isn’t at stake; the Arizona Cardinals have crashed the divisional party this year. Arizona holds a two-game lead over both Seattle and San Francisco. The Lions, Cowboys and Eagles will all be rooting for a San Francisco loss. And though Arizona’s playoff chances are better with a 49ers loss, its division title chances are better with a Seattle loss. We’ll let the charts do the talking for the rest of Week 13’s games. The most meaningful non-Turkey Day game is between the New Orleans Saints and the Pittsburgh Steelers, with more than 90 percentage points of playoff probability on the line. But, to close out this column, we thought we’d highlight some of the more interesting (or infuriating, depending upon your perspective) playoff scenarios that emerged from the 50,000 simulations that form the basis for this weekly feature. You can try your own hand at this with ESPN’s excellent Playoff Machine tool. But the scenarios below at least have a veneer of statistical plausibility. There were 2,029 instances (4 percent probability) in which an 11-win team did not make the playoffs. The Cowboys and the Eagles are the two teams most likely to suffer that fate. 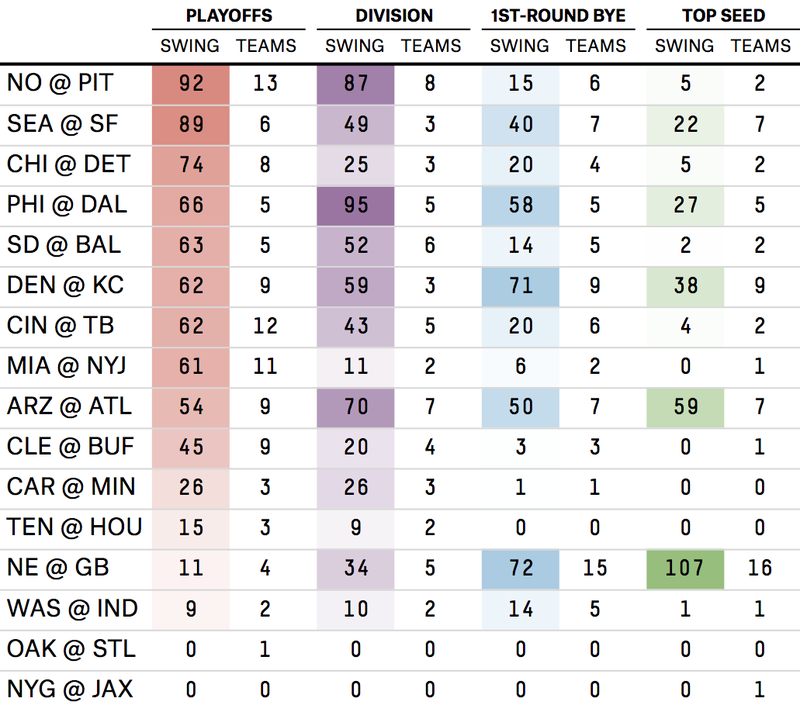 There were seven simulations in which a five-win team made the playoffs and an 11-win team did not. 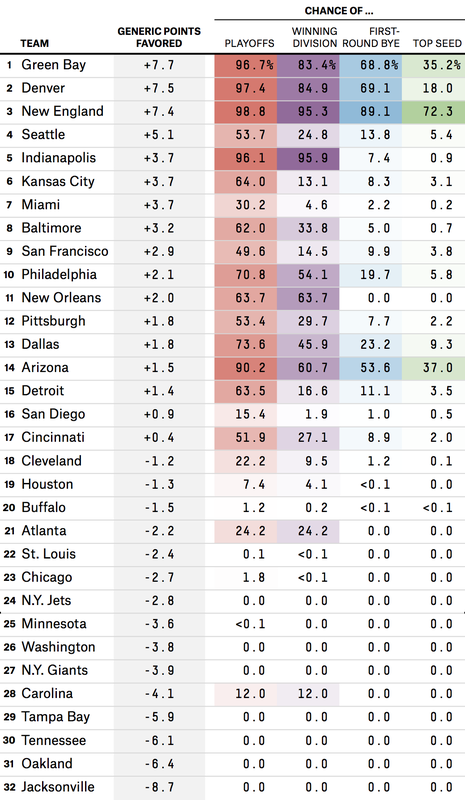 There were two simulations in which all four AFC North teams finished with 11 wins. A five-win division winner hosting a 12-win wild card team? That happened nine times in our simulations. The Packers own the head-to-head tiebreaker over the Eagles, and the 49ers own the head-to-head tiebreaker over the Cowboys. Of those 107 simulations, 89 resulted in a Carolina Panthers division title, and 18 resulted in a title for Atlanta.